This is what it is to be. Call it joy in youth, don't dare call it free. 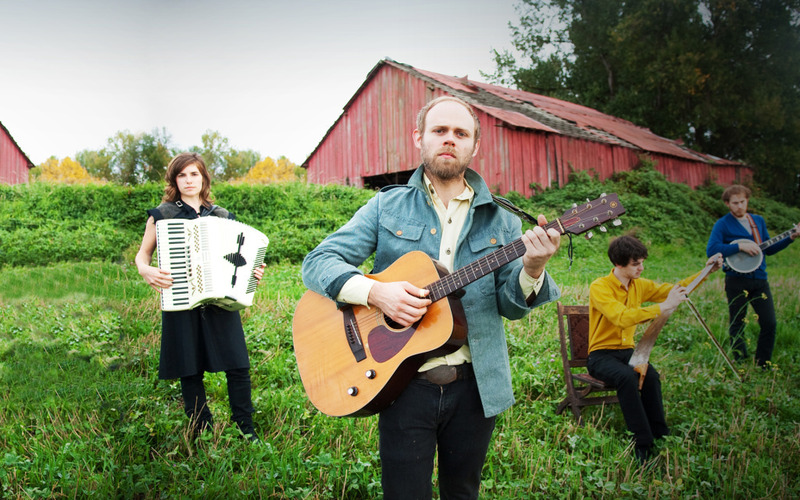 Horse Feathers is an indie folk band from Portland, Oregon. Singer-songwriter Justin Ringle (acoustic guitar, vocals, percussion) relocated to Portland after being front man for several groups in his native Idaho. Focusing on acoustic music, he began regularly playing open mics using the name Horse Feathers. After hearing a few of Ringle’s demos, multi-instrumentalist Peter Broderick offered to help produce them and, in February 2006, the two went to Skyler Norwood’s Miracle Lake studios and recorded their debut album Words Are Dead. It was released later that year (in September) on Portland label Lucky Madison. Peter’s sister Heather Broderick joined the band, playing cello, and in 2007 they began featuring a rotating cast of instrumentalists as back up members. In the winter of 2007 they recorded Horse With No Home, released on Kill Rock Stars in spring 2008. After a few changes in the line up, the current band consists of Justin Ringle (vocals, guitar), Nathan Crockett (fiddle), Catherine Odell (cello), and Sam Cooper (multi-instrumentalist). The four-piece band has been touring and released a new album, Thistled Spring, on Kill Rock Stars in 2010. Horse Feathers couldn't care less what year it is, or what trends are ruling music at the moment. Main man Justin Ringle makes timeless roots music, dusty and delicate melodies that flourish in a candle lit room, a back porch, or anywhere else people appreciate beautifully hushed folk. A native of rural Idaho, Horse Feathers formed in 2005 when Ringle moved to Portland, Oregon and recruited a rotating cast of accompanists (most notably Peter Broderick, who's played with M. Ward, Zooey Deschanel, Efterklang and others). Horse Feathers peppers their music with accents and flourishes: swooping fiddle lines, beautiful vocal harmonies, banjo, and accordion. But like the best folk music, these songs could stand strongly alone with nothing but Ringle's aching, just-stepped-out-of-a-sepia-toned-photo vocals and skilled songwriting. The band has three full-lengths under their belts, each with plenty of highlights. 2008's House With No Home begins with “Curs in the Weeds,” in which Ringle croons quietly as fiddle sways around him like a ship rocking drunkenly in the water. Belying its bleak lyrics, “Working Poor” sounds hopeful as a beautifully picked guitar parties with a banjo groove, and Appalachian vocal harmonies round out the track. “Heathen's Kiss” is another prettily hushed and melancholy track. But unlike the dark, desolate folk of label-mate Elliott Smith, Horse Feathers' sad tracks are so tender, so celebratory of the texture of Ringles' voice, that it's fun to listen to even if it isn't monsoon season or if you've just broken up with someone. 2010's Thistled Spring is Horse Feathers latest, and just as strong as House With No Home. “Belly of June” is instrumentally full, flying the border between American and Irish folk to excellent effect. “Vernonia Blues” is a dark country ballad showing Ringles love of Flannery O'Connor, and about as aggressive as anything Horse Feathers have done (which isn't very aggressive). Whether your record collection is on a ranch in Idaho or a tiny apartment in New York, Horse Feathers deserves a place next to Iron & Wine and Bon Iver.